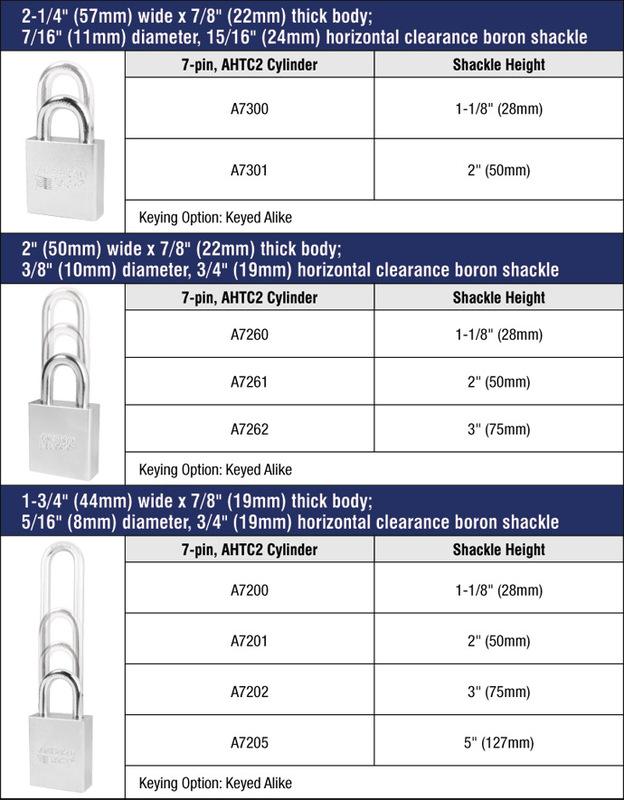 In three body widths, American Lock solid steel tubular cylinder padlocks have hardened, chrome plated solid steel bodies that resist cutting, sawing and corrosion and hardened boron alloy steel shackles for superior cut resistance. Pick resistant, these rekeyable seven-pin tubular cylinders provide more than 50,000 key changes and meet National Automatic Merchandising Association (NAMA) requirements. Includes A7300 and A7301, with specifications listed below. Includes A7260, A7261 and A7262, with specifications listed below. Includes A7200, A7201, A7202 and A7205, with specifications listed below.